Story: Hector Sandoval was a prolific drug runner, known for sneaking and delivering his cargo past borders and federal detection, until he made a mistake in taking a job that involved trafficking humans. Instead of returning the cargo, Hector set them free, upsetting the cartel he worked for and resulting in the loss of his mother and younger brother for his actions. Hector turned over his cartel for clemency, but ended up serving a 20 year sentence. Hector volunteered as a test subject in a kinetic molecular stimulation experiment for a reduced sentence. The experiment accelerated his molecules to a supersonic state that resulted in giving him enhanced speed and phasing through solid matter. Hector wears a special suit that allows his abilities to function while select items retain solidity for sight and touch. However, the experiment causes his body to be unstable after every use, so Hector must spend a full day in a special isolation chamber to restabilize his body. To Hector, this is a small price to pay for the loss of his family over his own crimes. Being a part of a super team is Hector's chance at redemption. 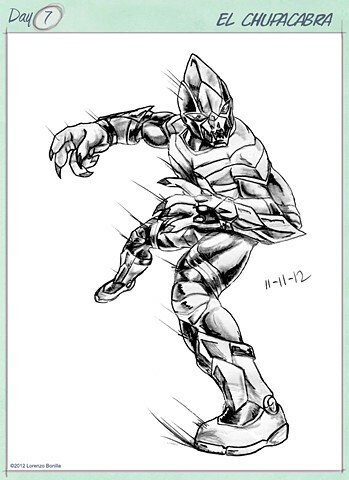 Abilities: Super speed, ability to phase through solid matter, and hyper kinetic reflexes. The Suit is made of flexible metal and cloth compounds that are resistant to intense heat and friction. Gloves and Boots are made out of heavily reinforced polymers to retain solidity for the Chupacabra, enabling him to interact with objects. Gloves also contain tranquilizer darts housed within the forearm ports. Special lenses enable Hector to retain his vision while in phase shift mode. Conception: I like the idea of designing a Hispanic super team and given our culture's fascination of myth and monsters; I felt a monster based on Latin America's most popular urban legend deserved the superhero treatment. His design has a direct influence with Ultimate Quicksilver, but I broke up sections of the outfit to give him an insectile appearance while using edges to accentuate speed.